Clean, clear, dry and old, with a lackluster finish that detracts from the excellent front end. 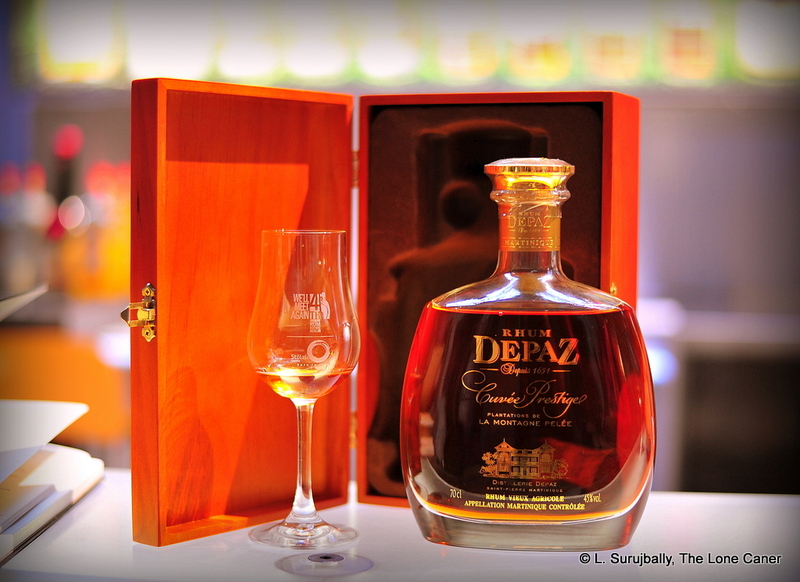 When I reviewed the Depaz Reserve Speciale a while back, I thought that the flavours seemed a shade sharp, too vague, and departed the scene with all the hurry of a street cur at which you threw a rock…or something to that effect. Most of these issues were absent from the Cuvée Prestige, which was a better rhum in almost every way. It is a blend of rhums aged between six and nine years, has a lovely outfit, and probably the top-of-the-line product from Depaz. I hesitate to recommend it at the higher price points I’ve seen, but must concede that I think it’s one of the better agricoles out there (bar the finish), and for those with deep pockets (or who can ferret out a more economical buy), it may be worth that kind of outlay…assuming their tastes bend in that direction. Points should absolutely be given for the packaging (oh come on, lie to me and say you never bought a bottle of something purely on the way it looks). The carafe-style bottle with gold etching (it shows the “castle” of Depaz and its date of founding, 1651) was surmounted with a gold-coloured cap and thick cork, and came in a wooden box with metal snaps, the design of which mirrored the bottle etching. It all looked very impressive, which it was: it just exuded an air of expensive Savile Row suits. As I’ve remarked before, when you’re at this price range, you’re absolutely within your rights to ask for some spiff on the wrapping, otherwise what are you spoiling yourself for? Who can you show off to? An unadorned barroom bottle can contain the elixir of the gods, sure, but who’d ever believe it does until they shell out the money, and who’d take the chance? The taste on the palate did not take any sudden left turns or quick swerves. It retained cleanliness and smoothness, which were endearing characteristics – I have to be honest, the medium bodied rhum had the smooth and relentless flow of a slow tidal wave of double cream. And it also continued to display the warmth and aridity of the nose. It hinted at sea-salt and sawdust, still more nuts, nutmeg, hazelnut and almonds. Some caramel, cigar smoke, sandalwood. It almost felt like one of Renegade’s rums, like, oh, the Guadeloupe 1998 11 year old; also the Cuba 11 Year Old, or even (shudder) the Coruba 12 year old. Letting it stand, and adding some water finally coaxed out the flavours I was hoping to have – figs, dates, some light vanilla and overripe black grapes, all bound together by the smell of crushed sugar cane stalks still weeping juice and drying in the hot sun. The finish was a weak point for me – smoky and sharper than it should have been (it lasted a good while, I can’t deny that), with not much going on aside from some closing notes of vanilla, and salted peanut butter. It had a good mouthfeel, nice body, good tastes around the edges, and the nose was heavenly, but I think that here, the slight dominance of the non-sweet brininess made the product falter as an overall experience for me (when related to the price – had it been cheaper, I dunno, I might have been more lenient). It’s definitely better than the Reserve Speciale, and I could see its overall quality, feel its texture, and acknowledge that in my scoring. But I’m afraid it’s not my cup of tea, really, not entirely. Therefore, dear buyer, if money is an issue, it’s a rum that you might wish to taste first (if possible) and checking it fits in with your personal profile preferences, before shelling out. It’s a very good rum in its own way, and just because that way meanders apart from my own path doesn’t invalidate the product on its own merits. Online cost shows wild variation. I’ve seen everything from €80 to €250, with one reviewer remarking that it can be had for substantially less on the island itself. While I’m not privy to the sometimes obscure pricing mechanisms of web stores, I don’t think I’d shell out more than €100 for this one, both for the cool looks and lovely taste, and also because of the failed backend. It would have to be a hell of a lot rarer and more in line with the personal preferences I have, to convince me to part with that much of my hard earned balles. 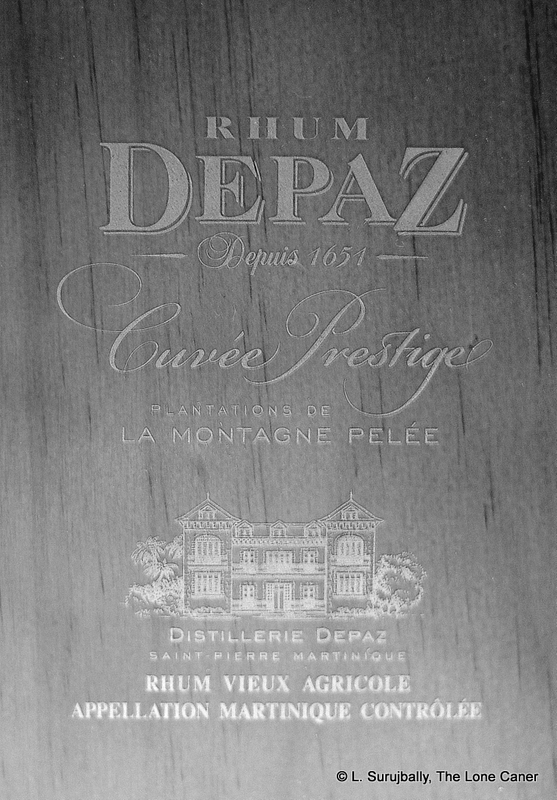 Nowadays it’s owned by Bardinet (who also make the Negrita line of rums I’ve never tried), but who, interestingly, make no mention of Depaz at all on their (poorly designed) site. There are days I wonder how advertising is really done for products this good: maybe that’s what we reviewers are here for. After all, if we shell out some cash to buy the thing and like it (which is a chance the makers seem to think is worth taking), then they don’t have to. I’ve made my peace with that situation a long time ago, but there’s no doubt I still feel a twinge of annoyance about it – we should not be seen as a free resource, to act as a substitute for their reluctance to advertise properly on their own account. Complex, yes. Quality, not entirely. 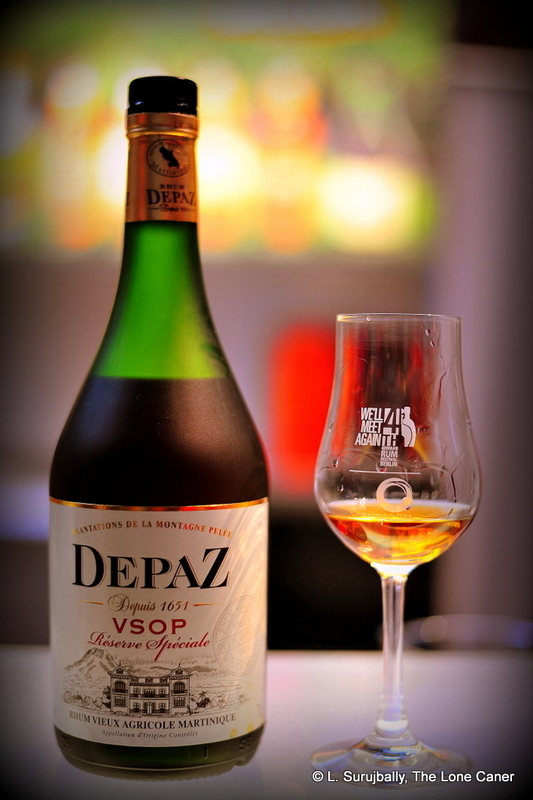 Although the Depaz VSOP Reserve Speciale is noted as being a complex agricole, not much except perhaps the taste of the reddish brown rhum deriving from the Plantation de la Montagne Pelee really works for me as it should, which just goes to show that not every single spirit hailing from a part of the world supposedly making only top-end products can be as good as it is meant to be. Part of the issue here (I hesitate to say “problem”) is that all sensations go by too fleetingly for any real impression to be left, and what was there just never came out the way it might have. The Depaz agricole is a Tolkien elf running across the snow, and leaves few footprints worthy of remark. Which is somewhat odd for a spirit that is bottled at 45%: that strength alone would lead you to assume some intensity and heft in the profile. But nope, not really. At least not in this one, and it starts right away in the nose. Unlike some really stellar exemplars of the craft (think Damoiseau 1980 or even the Karukera Millesime 1997) which wafted a cloud of deep, luscious scents into the room as soon as the bottle was cracked, the Depaz seemed thin and reedy as a hungry rice-eating mongrel’s ribs, and like such a pooch’s snarling attack, it was sharp and fast and over way too quick. There were underlying aromas of grass, crushed cane and rosemary, some subdued hints of apricots, fruits, flowers and sweet bubblegum, followed by faint leather, and the damp musky smell of cheap cigarettes smoked in the midst of a tropical rainforest with high humidity (having done so in the past, I know whereof I speak). But it was all too little, too sharp, and too scrawny for the schnozz of this reviewer, who openly prefers more aggressive fare. The taste in the mouth on the other hand elevated the drink quite a bit, and made me check my glass to see if I had confused my samples. It was stronger and more assertive, very nicely warm without the spiciness of the nose…a bit more body you might say, entering quite cleanly and clearly. Sweet and solidly fruity, it opened with sugars and some oakiness, chopped light fruits (green grapes, white guavas), licorice (odd in a Martinique AOC agricole), bleeding sap from a fresh cut cane stand, green leaves and even a flirt of vanilla and caramel. The complexity was hinted at but seemed scared to come out and strut its stuff and therefore, while it was discernible, it never quite took centre stage. I should however remark on the mouthfeel and texture, which wasn’t bad at all, coating the tongue well and warmly, allowing some of those tastes to take on greater prominence after a few minutes. Here adding some water had to be done with some delicacy, as too much would have shredded an already unaggressive drink, and too little wasn’t enough to release the additional flavours that lay hidden. The finish was an overall disappointment, by the way – there was a backtaste of cane juice on a cutlass blade (I kid you not – it had both metallic and vegetal notes), some sugar water, vanilla, a little oakiness, too quick and too sharp to appeal to me. 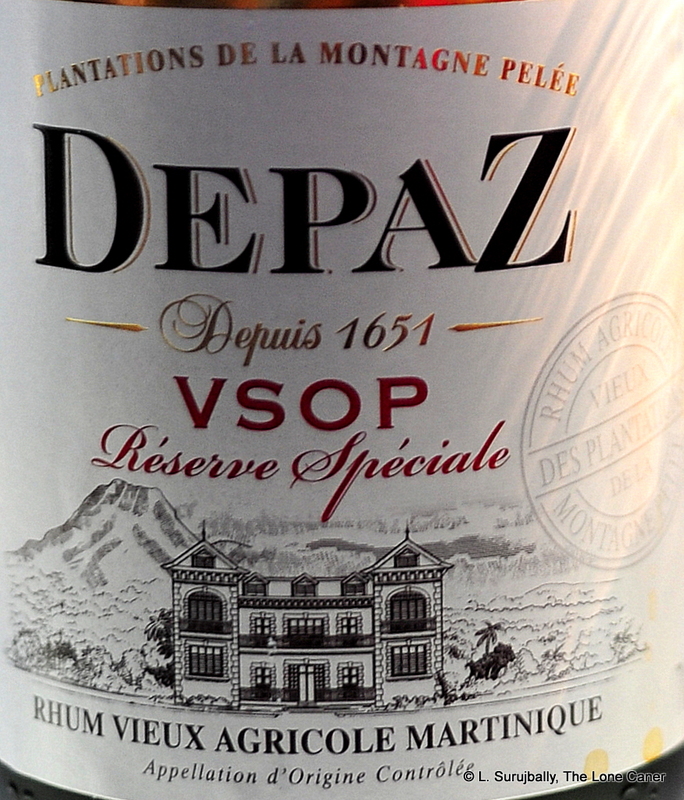 Depaz hails from the eponymous estate in St. Pierre in Martinique, and is located at the foot of Mount Pelée itself: it’s been in existence for over three hundred years, sicne 1651 in fact, when the first governor of Martinique, Jacques Duparquet, created the plantation, and these days bears the AOC mark of terroire-based authenticity. Although the famous eruption of the volcano in 1902 decimated the island, Victor Depaz, who survived, reopened for business in 1917 and it’s been operational ever since. 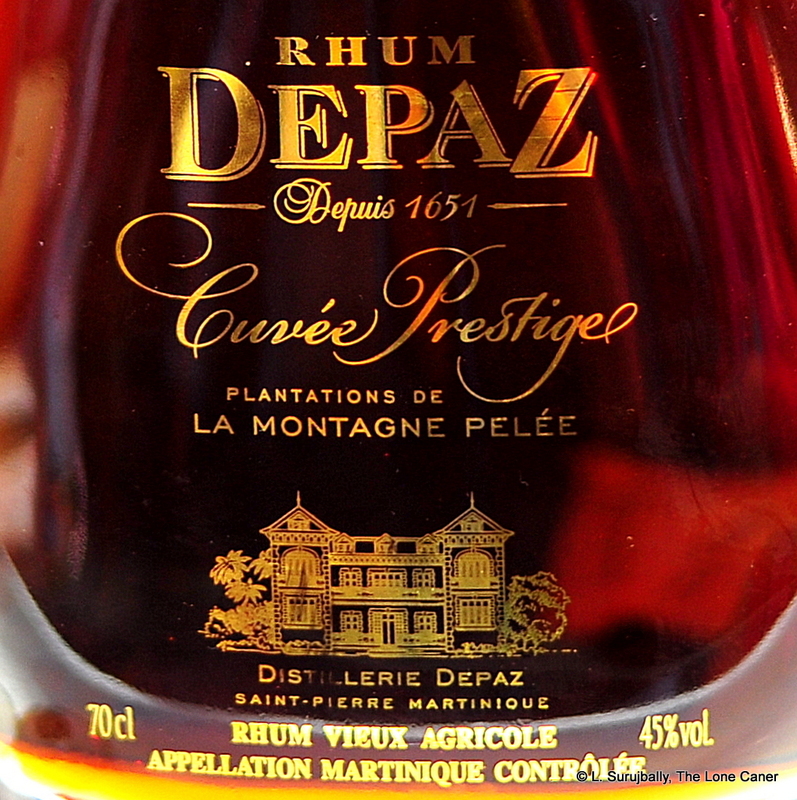 The company also makes quite a few other rhums: the Rhum Depaz, a full proof 50% beefcake, a blanc variation, the Blue Cane Rhum Agricole (which are all a little down the evolutionary ladder), as well as an XO and the Cuvee Prestige (a little above quality-wise, a lot more price-wise). I’ve heard that the VSOP was made with a single column copper still (and was unfortunately unable to confirm it), aged for seven years in charred oak casks, from cane juice (of course) and without filtering or additives; it is presented in a bottle more reminiscent of wine or champagne, but you have to kind of admire such audacity – it sure sets it apart from the crowd. Anyway, let’s pull it all together. I tried this three times to see whether my opinion changed (and it didn’t), but my overall lack of passion should not entirely dissuade you: there were aspects of the rhum that worked well (the palate in particular). My own predilection for more intricate, stronger and deeper flavours should not be seen as a blanket indictment of any rum that doesn’t conform, or which those persons with a liking for subtler, lighter rums would enjoy. This is where knowing your preferences comes in handy. Lovers of soleras, Bajan, Panamanian or Demerara rums are not likely to swoon here. Trinis, maybe; Cubans and Jamaicans, quite likely. And people with a penchant for agricoles will probably like it – for the same reasons I couldn’t muster serious enthusiasm, in all likelihood. Some might consider this to be like a black mongrel’s left leg – it ain’t right, and it ain’t fair – but that’s the way it is. And that’s also as it should be, because if we all agreed on everything, then all of you reading this would want to pilfer all my rums…and be in love with my wife. In Europe this goes in the €60 range. My own feeling is that if you can spare the change, go a step or three up the ladder for the Cuvee Prestige, which is a very good rhum indeed, and which I’ll look at in my next review.